Freshsales has recently enhanced there lead scoring system by bringing forth COLD, WARM, and HOT leads. 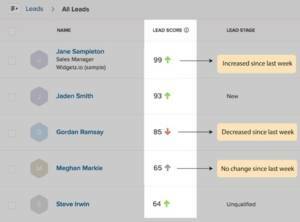 Lead scoring helps you segment those leads who are most interested and those who need further nurturing. You can even customize the lead score rules that can help you personally define those leads you value. For example, many of our client’s value when their leads click or open an email. With that said whenever a lead clicks or opens that email, that specific lead can then get additional points added to their scoring. This really helps you differentiate those who are active leads and those who are not. Sign up for a free trial here! You can view each lead’s activity by simply placing your cursor over the lead and their lead scorecard will appear. The lead scorecard will tell you every activity that contributed to either increasing or decreasing that leads score. Again, as mentioned before you could see that the lead opened your email thus increasing their lead score. There is now arrows indicating whether has been an increase or decrease in the prospects lead scoring. Green up arrows indicate an increase in the lead score over the past week. Red down arrows indicate a decrease in the score over the past week, for ex, if they have unsubscribed from your emails. Grey up arrow indicates inactivity for the past week. As Freshsales Consultants we can help you get the best out of your CRM. Don’t work for your CRM, let us help you make your CRM work for you. If you have any questions or require any assistance with Freshsales. Please get in touch with us.